FREE USPS PRIORITY MAIL SHIPPING (2-3 days) within the United States international and all other shipping please email for pricing. Putting "U" in mokume since 1997. Mokume gane is a decorative metal that is made by fusing different non-ferrous metals together through heat and pressure. Different makers use different metals. History - Mokume gane was developed by the Japanese in Feudal Japan. The man given credit for initially creating mokume gane is Denbei Shoami who lived from 1651 to 1728. 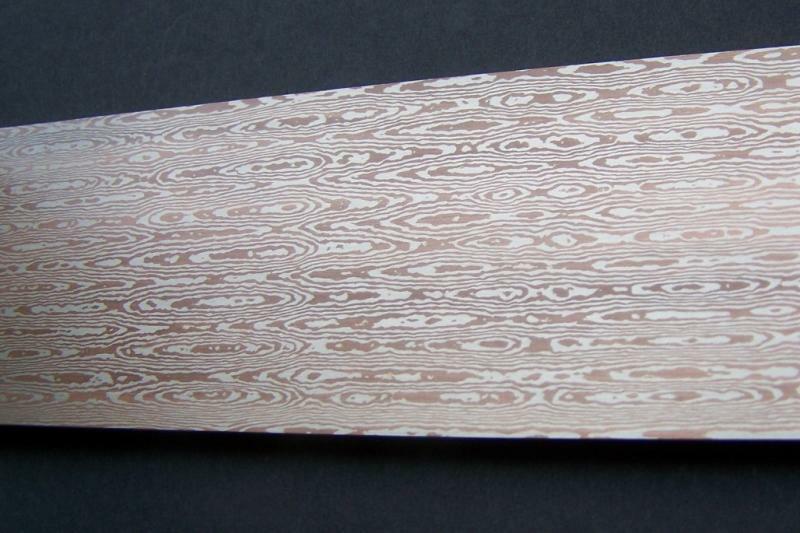 Mokume gane translates from Japanese as “wood grain metal” and was named thus based on the obvious, how it looks. It was brought to the West in the 1970s and 1980s mostly through the effort and work of Hiroko Sato Pijanowski and Eugene Michael Pijanowski. Browse the current inventory pages or e-mail us to place an order. Anything in inventory will ship within 2 business days of receiving a cleared payment. We do accept checks and will gladly remove any item from the website for you should you wish to purchase it without using Paypal. Just send us an e-mail letting us know what you would like. Please feel free to contact us if you need any bar listed cut to a different length for you as well. Don't forget - if you don't see what you are looking for in our current inventory, just email us to place an order!